Matt King: "We Are More Reliant On Central Banks Holding Markets Together Than Ever Before"
... which as Wolf Richter showed on Friday meant that European junk bond yields are now on top, if not lower than 10Y US Treasurys, indicative of a market that has "gone nuts" largely thanks to the ECB's daily intervention, which as reported moments ago, now holds €103.39BN in Europe's corporate bonds, or nearly 13% of the total outstanding. Today, perhaps troubled by the ongoing distortions in the European bond market, Citi's global credit strategist Matt King also looks at the European bond market and in a note titled "Partying like it's 2007", he looks at recent development in the Investment Grade bond market and writes that "after the rally in recent weeks, the 53bp z spread on € iBoxx Corp is 20bp wide to the 33bp it reached in June 2007. However, he noted that a straight comparison of the index spread level now with then is misleading." King points out that a huge decline in index rating quality means that, on a like-for-like basis, spreads would only be 41bp: just 8bp shy of the tightest € IG spreads ever. This means that the upside is very limited: "Even if we do rally back to the all-time tights, that would equate to less than 0.5% of excess returns from here." 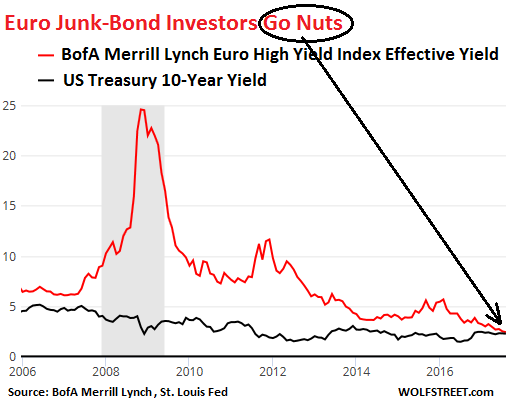 We won't go into the details of the breakdown of the adjusted credit spread, but we will highlight a key thing in King's observations, namely what is the true level of European leverage, and what is prompting this market distortion (spoiler alert: central banks). Sceptics may argue that the system is much less levered now than in 2007, and (insofar as it goes) this is true. Back then, the response to tight spreads on what was believed to be low-risk assets was to lever up – by taking exposure through a hedge fund buying on margin and benefiting from European banks’ lack of constraint on leverage ratios, or by buying a structured product which leveraged the underlying assets. Still, even if the growing back then leverage may have been a source of risk, King is not so sure that it all led in the direction of spread tightening, and as he adds "we are doubtful that today’s one-way reach-for-yield, in which many investors have almost despaired of relative value as a concept, is as much safer as regulators like to think." To the extent that higher gross CDS notionals (Figure 14) are a crude reflection of this increased leverage, much of the trading being done involved relative value relationships – shorts as well as longs – in a way that simply doesn’t happen today. Indeed, it feels to us as though markets were much more two-way back then than they are now. In some sense the additional leverage clearly did add to systemic risk – it is impossible to look at the 2008 liquidity squeeze and argue otherwise – but we are doubtful that today’s one-way reach-for-yield, in which many investors have almost despaired of relative value as a concept, is as much safer as regulators like to think. Probably the biggest source of “artificial tightening through leverage” back in 2007 was the volume of synthetic CDO issuance. Synthetic CDOs (CSOs) effectively created negative net supply, as net protection selling by investors forced dealers to buy bonds to hedge their books, dragging both CDS and cash spreads tighter in the process. From 2003-2006, global delta-adjusted CSO issuance ran around $300bn/year; in 2007, this increased over $600bn. But the comparable number today is the buying from global central banks. This too produces an “irresistible force” driving spreads tighter, which investors feel powerless to resist. And the volumes are much larger still, averaging around $1.2tn/year (Figure 15) relative to CSOs’ $3-600bn. Admittedly this is spread across asset classes, with the CSPP in isolation amounting to only €80bn – but to take the latter number would to our minds grossly understate the additional demand created in credit. While it’s essentially impossible to isolate an undistorted credit spread in either case, the fact that the increasingly finite demand of central banks is what has facilitated such tight spreads in the first place is hardly reassuring. What does this mean for returns? The post-adjustment 8.5bp of additional spread on the current index relative to the 2007 tights equates to less than 0.5% of index return – from the point where spreads are back to the tightest level on record. And that was a level that with hindsight was driven by leverage and unrealistic assumptions about credit quality – of banks, of corporates and of sovereigns. The aftermath was not a pretty sight. Between record high valuations, FOMO, and confidence that central banks will come to the rescue once again, not to mention the MSCI World Index and the DJIA both hitting yet another all time high, the answer appears to be a resounding yes.